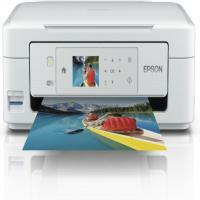 Epson XP-425 is an ideal solution for any home or working environment. This model supports Wi-Fi direct for homes without network and it also offers mobile printing. This all-in-one device has a 6.4cm LCD screen with touch panel and a memory card slot for easy-to-use PC-free photo printing and copying.The printer weighs approx. 4.3 kg measuring 390‎ x 300 x 145 mm (Width x Depth x Height). It supports scanning and printing from anywhere through Epson connect.This device can also print through the cloud. Epson XP-425 can deliver a maximum resolution of 5,760 x 1,440 dpi for prints and 1,200 dpi x 2,400 dpi for scans.It has one paper tray with a capacity of 100 sheets of standard paper and 20 sheets of photo paper. The printing speed of this printer is 15 pages/min for colour files, and 33 pages/min for monochrome. It takes 54 seconds for one 10 x 15 cm photo to print. Epson XP-425 can print, copy, scan and fax. It can deliver everything from professional text documents to brilliant photos. Multiple users can easily share the Epson XP-425 wireless inkjet printer as it has Wi-Fi connectivity. How to improve print quality of your Epson XP-425 printer? Select Custom as the Colour Correction setting on the printer driver's More Options tab. Click Advanced, and then select anything other than PhotoEnhance as the Colour Management setting. 1. Select Colour Matching from the printer driver's pop-up menu, and then select EPSON Colour Controls. 2. Select Colour Options from the pop-up menu, and then select anything other than PhotoEnhance. Q. Do you provide the customers with a cash on delivery option when purchasing Epson XP-425 ink cartridges? A. Unfortunately, we do not offer cash on delivery for our products yet. But we do provide other payment methods like PayPal and various debit/cards like Laser Card, American Express, MasterCard or Visa credit card, Maestro, Switch, Solo or Delta debit card. All our online payment methods are extremely safe and secure. Q. How is the print quality of Epson XP-425 printers? A. Epson XP-425 is capable of producing great quality output. It is well known for its vivid photos. This printer can print at a resolution of up to 5,760 x 1,440 dpi. Q. Should I perform a printhead clean even though the ink levels of my Epson XP-425 ink cartridges are low? A. Cleaning the printhead when the ink levels are low can cause damage to your printer. Performing a printhead clean requires some ink from the ink cartridges. It is advised that you replace the ink cartridges with new ones before performing a printhead clean for your printer. Q. My Epson XP-425 printer displayed a message stating that the ink pad is at the end of its service life. How do I replace the ink pad? A. The ink pad cannot be replaced by the user as it is not a user serviceable part. You will need to contact Epson support in order to change the ink pad. Once the ink pad has been replaced you can continue with your printing. Q. I ordered a multipack of 20 Epson XP-425 ink cartridges. How long would it take for the cartridges to be delivered to me? A. If you placed an order for the cartridges before 12 noon, they will be delivered at your doorstep within 1 - 2 days. If your order is urgent, you can also contact us on 048 30833221. We will check our stock and try to deliver the product to you as fast as possible. Q. How can I replace my Epson XP-425 ink cartridges with the old ones? A. Please refer to your Epson XP-425 printer’s manual for step by step instructions for replacing the ink cartridges. Q. Hello, I want to know what is the ink capacity of your compatible Epson XP-425 ink cartridges? A. The ink capacity of our compatible Epson ink cartridges is same as of the genuine Epson ink cartridges with 11.5ml of ink in the Epson 18XL black ink cartridges and the 6.6ml of ink in each of the colour cartridges. Q. The print quality of my Epson XP-425 printer has been decreased. Is this due to old ink cartridges? How can I find if the ink cartridges are too old for printing with my Epson XP-425 printer? A. There may be a decrease in the quality of prints, if your Epson XP-425 ink cartridges have been installed for more than 6 months. This is because the ink may start to dry out and causes the ink to become clogged. The decrease in print quality can be also because the nozzles on the printhead are clogged with ink. This can lead to the missing colours resulting in colour cast. For this, use the user manual for nozzle check utility to check the print head nozzles. Q. How to know if the paper I am using for printing is suitable for my Epson XP-425 printer? A. Using the proper media is very necessary, when printing the photographs. It is recommended to use only the paper supported by Epson to get the best quality from your Epson XP-425 printer. Use only one of the recommended Epson paper types with your printer. Q. Does the Epson XP-425 printer supports double sided printing? A. No, The printer does not supports double sided printing. You have to do it manually. Q. Is the Epson XP-425 printer is compatible with Windows 10? A. Yes, the printer is compatible with Windows 10. Q. What is the difference in your own brand and the original Epson XP-425 ink cartridges? A. The original Epson XP-425 ink cartridges are manufactured by Epson itself and our compatible premium brand Epson ink cartridges are recycled/remanufactured by third party manufacturers. The compatible premium brand cartridges are cheaper than the original ones. The ink volume content for original black Epson 18XL cartridge is 11.5ml and for colour cartridges is 6.6ml while the ink volume content for compatible black Epson 18XL cartridge is 16ml and for colour cartridges is 11ml. Even being compatible ink cartridges they provided quality prints as good as the original ones. These cartridges are factory tested to perform as better as the original ones and work perfectly fine with all the compatible printers. Q. Can I increase the print speed in my Epson XP-425 printer? Q. How much does the Epson XP-425 printer weight? A. The printer weighs approx. 4.3 kg which is without print cartridges and the power cord. Q. What is the maximum resolution the Epson XP-425 printer can scan? A. The Epson XP-425 printer can scan maximum resolution of 1,200 x 2,400 dots per inch. Q. Can you tell me the type of ink used in these compatible Epson XP-425 ink cartridges? Is it pigment based or dye based? Q. Hi, do I have to reset the chip for these compatible Epson 18XL ink cartridges or they have already been reset? A. The chip on our compatible Epson 18XL ink cartridges has already been reset and are ready to install and use directly in your Epson XP-425 printer. Q. Can you tell me if the Epson XP 18XL cartridges also known as the Epson XP-425 ink cartridges work with my Epson XP-305 printer? Q. I have a Epson XP-425 printer at my home. The copy quality of my printer is getting poor. Can you help. Q. Will these compatible high capacity Epson XP-425 ink cartridges work with my Epson XP-405 printer?